Before the Pentax Spotmatic came out in 1964/65, Asahi had already been producing SLRs for over ten years. 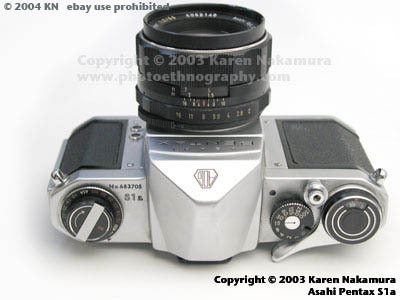 The first Asahiflex came out in 1952 with waist level viewing and they attached a pentaprism for eye-level viewing in 1957 with the first Pentax. Using the text or images on this website without permission on an ebay auction or any other site is a violation of federal law. There were several versions of the Pentax. The Pentax S (1958), S2 (1959), S1 (1960), S3 (1960), and then finally the S1a. In America, they were given similar names by Honeywell, the official distributor: the H, H2, H3, H1, and H1a. As you can see, the numbering wasn't strictly sequential. The lower numbers indicated that the camera didn't have the highest 1/1000sec top speed and were intended for amateur use. But the odd thing about Asahi was that they wanted to produce a low-cost version, but they didn't want to dedicate the tooling. So they simply took the high-end camera and changed the shutter dial so that the highest reading was 1/500 sec. In reality, there was still that extra click stop for 1/1000 sec. You just dial it one past 1/500 sec. (shades of volume '11' in Spinal Tap). The S series didn't have a built-in light meter. That came with the Spotmatic series. But you could get a clip-on light meter that attached to the top and was coupled to the shutter speed. The fixed focal length Super-Takumars in the M42 Pentax/Praktica screw mount that came with the Pentaxes easily were at the top of their class when they came out and they still best all of the consumer level zoom lenses that people buy. They were multi-coated with a very hard coating process. If you see a Super-Takumar, buy it. Although photography teachers like to recommend the Pentax K1000 and its clones for their students, I think they'd be better off recommending early screwmount Spotmatics. The lenses are excellent and in good supply, the metering is still spot on, and best of all, prices are still reasonable. The Pentax K bayonet mount is excellent, but I still have a soft spot for the screw mounts. Note: Using the text or images on this site in an ebay auction without permission is a violation of your ebay Terms of Service. I will report you to ebay if I discover such a violation taking place. You see both Asahi Pentax and Honeywell Pentax cameras on the market, what's the difference? Asahi Optical Company is the manufacturer of the cameras and has a very hallowed history. It was founded in 1919 to make optical lenses. 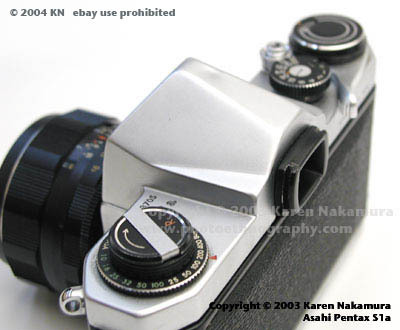 It came out with its first SLR, the Asahiflex I in 1951. 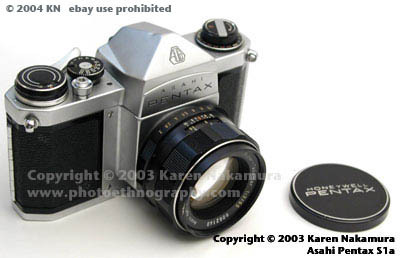 Pentax is the name of their first SLR with a pentaprism (penta-prism = pentax) which came out in 1957. Since then, it's been their tradename for their series of SLRs, just as EOS is the trade name for Canon's electronic SLRs. Honeywell was the U.S. importer for Asahi cameras until the mid-1970s. 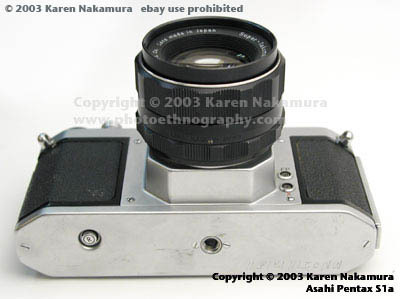 Cameras that they imported are stamped "Honeywell Pentax" on the nameplate, not Asahi Pentax. With the minor except of one camera that was designed to accomodate a Honeywell flash unit, Honeywell Pentaxes are identical to Asahi Pentaxes. About the only things with a stronger cult following than the Pentax screw mount cameras (Spotmatics) are their K-mount cameras, including the K1000. The K1000 which is now being made by Chinese companies and branded under Chinon and other labels, is often recommended by photography instructors. This has caused the price to stay about $200 for a new set. My own recommendation is to stay with the screw mounts. There is a wider variety of lenses and prices are relatively good. There's also a very strong cult following around their gargantuan Pentax 67 medium format SLRs. Trivia: "Pentax" was one of the names the Nippon Optical Corporation cycled through when coming up with the name of their new camera in 1948. They ended up calling it the "Nikon" instead. Pentax-Manuals.com - free manuals, etc. I saw your web article about the S1a and its unmarked ~1/1000 speed. I recently bought the type lens it used, a Super Takumar 55mm/2. This one was of the earliest type (engraved aperture numbers increasing from left to right). This lens has an unmarked aperture setting, one click stop before the f/2. It must be f/1.8. On inspection, with the A-M tab set to M, I found the aperture to be wide open at the unmarked stop and slightly closed at the f/2 stop! My guess is that they left out the part (waterhouse stop?) that was supposed to prevent f/1.8 use. Maybe they just put a new ID ring on a 55mm/1.8 lens they had around. So Pentax may have made a some S1a cameras where both the shutter speed and aperture capabilities were the same as for the SV. Re: f/2 -- stellar insight. They might have allowed f/1.8 for focusing, but felt it had too many optical aberrations (especially in the corners) as an official f/stop -- i.e., one that the magazines would pick over in their lens tests.